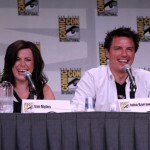 He also said not to expect an explanation of where Jack went at the end of Children of Earth (the last Torchwood installment). Miracle Day is set in a world where people suddenly stop dying, which causes Captain Jack to return from a long absence. When the C.I.A. starts sniffing around for details about Torchwood to help investigate, things start heating up. Also on the panel were cast members Eve Myles, Mekhi Phifer, Alexa Havins, Bill Pullman and show scribe Jane Espenson (Buffy the Vampire Slayer, Caprica). “Think of the big picture when you watch this. Don’t be afraid to think really hard about what this show is about, because we thought really hard about it,” Espenson said. Also worth noting is Barrowman’s singing performance (see video embedded below) and his comments about Captain Jack appearing on the Doctor Who 50th anniversary special in 2013. Starz has released the teaser for the rest of the season, which we’ve embedded below. You can catch Torchwood: Miracle Day Fridays on the Starz network.